Early Sunday morning we got back into town. We are tired. 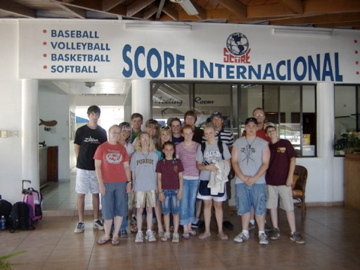 I didn’t want to leave the ministry in the Dominican Republic. Personally, I wanted to adopt at least 5 kids from the villages or orphanages we visited. I am so proud of our team for the spiritual initiative and giftedness they pour out on this mission. The fruit was immediate in their lives and ours. God is glorified. May we repeat more of the same here on our home turf. thank You for the opportunity to glorify Your name in the Dominican Republic. thank You protect us and keep us safe as we flew, during Kiko’s bus driving, and walking around the various villages. thank You for the strength empowered within us as we did new things in a strange place. thank You for opening up the floodgates for you glory to shine through us. thank You for using us as lights of your Sons grace. thank You for Your love and allowing us to show Your love to the unlovable. thank You for bring our team together as One. thank You for using our hands to touch minister to Your orphans, and allowing Your love flow through us. thank You for spiritual nourishment and immediate fruit the people we feed, clothed and played with in the sugar cane villages. thank You for the spiritual healing those we sought to nurse in the medical clinic. thank You for the numerous souls redeemed through our drama “Tired” and Your gospel message. thank You for being the center of our worship. thank You for humbling my prideful heart from the joyful poverty of the people we met. thank You for creating a beautiful island with beautiful people.